If you’re any kind of Star Wars fan, then you probably know about a lil’ old film called The Empire Strikes Back — arguably, the best movie in the entire franchise. Now, what you may not know, is that being partially set on the icy planet of Hoth, the filmmakers chose to shoot parts of Empire in Norway for an authentically cold and snowy setting. 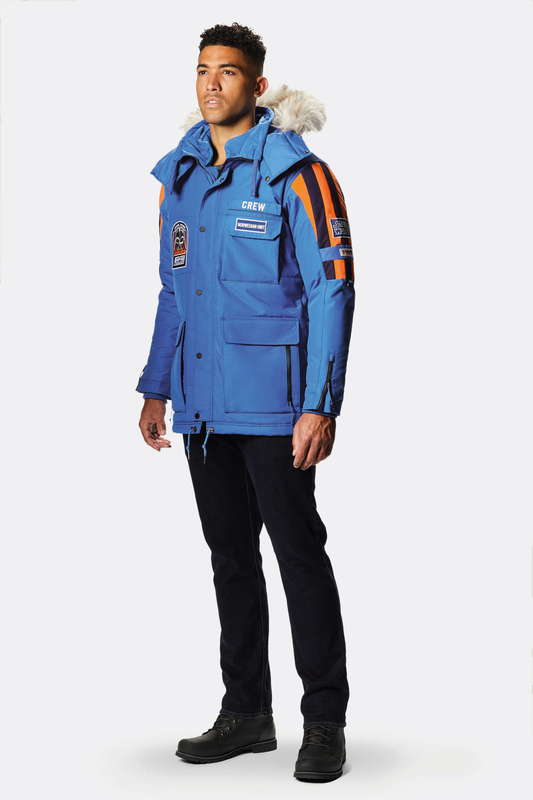 …including these legendary blue parka jackets. This is Mark Hamill, Carrie Fisher, and producer Gary Kurtz sporting the jackets on set back in 1979. * Back in 1979, when making Empire, crew gear was NOT a thing that films made (not like it is today). So this was wildly unique for the time. * There were only a few dozen of these jackets actually made. * They were custom made by a local Norwegian company that no longer exists. * When they DO come up for auction, they can sell for well over $7,000. * And, ya know, it just looks so damn cool — there’s a friggin’ Darth Vader in flames patch on it! Rest assured, a lot of love went into the making of the jacket, too. Lucasfilm and Columbia worked closely together to balance both the nostalgic design of the original — down to perfect recreations of the patches — and the technology of modern performance wear. There’s even an added Easter egg (of course!) inside each one — a patch with the coordinates of the Hardangerjøkulen Glacier — the exact shooting location of the Hoth scenes. “But is it even a PRACTICAL jacket? Or does it just LOOK cool?,” you might ask. Well — let me tell you, this thing is LEGIT. Because I put it to the test in the coldest place I could find in Los Angeles…an ice rink. I KNOW, it’s not as cold as sub-zero temps in NORWAY, but work with me here, folks. It’s the best I could do without flying halfway around the world. I only had a T-shirt on underneath the jacket but I felt as cozy Luke Skywalker tucked into a Tauntaun’s belly. It was like wearing a giant comforter!!! Some tech specs: It’s a high-performance jacket, so it’s waterproof, breathable and features Columbia’s patented Omni-Heat thermal-reflective lining and insulation. TL;DR — this thing is warm AF. But here’s the very best news — YOU CAN GET ONE, TOO. 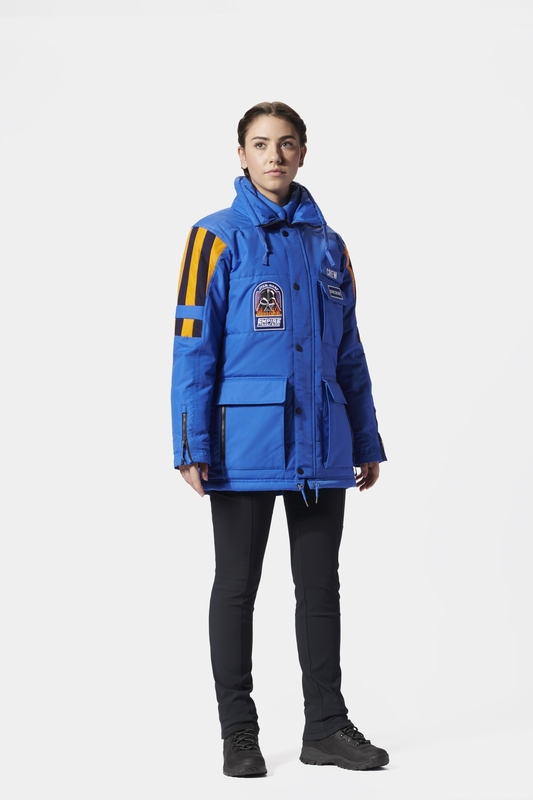 The jacket will also be sold in-store (during retail hours) at select Columbia-branded retail locations in the U.S., Canada, Europe, China, Hong Kong, Japan, and Korea. Do or do not (get one of these). There is no try. JK, you can totally try because they’ll probably sellout FAST!